My regular cinema routine is bringing a bag of grease less nuts to munch on instead of indulging in a bucket of calorific butter popcorn. This is my favorite peanut to date. It’s seriously grease less, not as salty as the popular brands and has lots of garlic chips that does not leave you with a nasty breath. Before, I used to travel all the way to Pampanga in order to get my monthly stash of these delicious nuts, I’m so happy its now available here in Metro Manila particularly at my favorite neighborhood stores here in San Juan. This entry was posted by Fran Haw, who has written 2 posts as frannywanny, on Tuesday, November 10th, 2009 at 2:50 pm and was filed under Instant Meals. i really love peanuts… basta meron nyan sa bahay talagang tinitira ko… mukhang masarap ata to ah… try ko nga..
Mani! 😀 nom nom nom. ok na pulutan. Where can I buy Allies Wonder Peanuts and what’s their phone number? Need to know were can I purchase these nuts in the South Bay Area in California or greater Los Angeles, California. I always ask my mom from Floridablanca, Pampanga to buy me these kind of peanuts everytime I have relatives coming to the U.S. 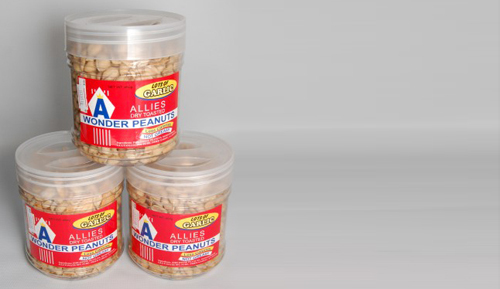 I just wish some Filipino business owners here in Los Angeles, CA will invest on selling these here so Allies Wonder Peanuts will easily be purchased anytime by Filipinos like me.